A few weeks back, we found out that one of our dearest friends is going to be moving out of the area, and Jeremy and I offered to throw a going-away party for him. This was a pretty big deal for us, because we’re kind of hermits—I think we’ve only even attended one party in the last year or two, and I’ve never hosted anything organized before. But since we rarely have company and I don’t get out much thanks to the baby, I was actually pretty excited at the prospect, and I spent a lot of time poring over menu options. In the end, I went with mostly Italian and Mediterranean flavors, for several reasons: our friend has Italian roots; I personally love Italian food and feel pretty comfortable cooking it; and a lot of Italian food is good, or even meant to be eaten, at room temperature. To make it easy on myself, we planned on bruschetta with a variety of spreads and toppings, and a few other items for snacking. The party was at 3pm on a Sunday to give me most of the weekend to cook and clean up. With our little guy to take care of, I needed every moment I could get. I ordered a serving platter and a tablecloth from Amazon, and on Friday night we hit Fred Meyer for groceries and disposable plates and cups. On Saturday morning, I walked over to the farmer’s market for all the fresh produce I would need, determined to make the party food as local as possible. Somehow I managed to lug home red peppers, Roma tomatoes, peaches, boysenberries, garlic, prune plums, lettuce, goat cheese, mushrooms, zucchini, and a huge bouquet of flowers for the table. Nolan slept the whole time, and let me get a head-start roasting peppers and oven-drying tomatoes before joining us for the afternoon. All in all, by Saturday night, we had finished several bruschetta spreads and toppings, baked off one type of bread and made the dough for another, and got elements started on several other items. The day of the party I made one more dip, fried zucchini, baked a crostata and finished making the watermelonade; Jeremy shaped and baked three loaves of pain a l’ancienne, and we both did a bunch of cleaning and organizing. I ran out of time to toast the bread, but it was freshly baked and no one seemed to mind. Nolan cooperated again by taking a three-hour nap that ended just as the first guests arrived. Of course, that meant that I had to go feed him and pump, and missed the first half hour of the party, but most folks didn’t show up until after that anyway. The food was all well received and worked well at room temperature, as I’d hoped, and I think everyone had a good time. We had quite a bit of leftover dip and such, but I found a few creative ways to use them up. There are too many items to cover in a single post, so I’m going to break it up over several days, and mention what I did with the leftovers at the same time. I’ll start with a few of the spreads and miscellany. I made three spreads to go with the bread: garlic-white bean hummus, fig-kalamata tapenade, and a third one I’ll discuss later. The hummus was technically more of a bean dip because it didn’t contain tahini, but it did have a nice garlic zing from raw and skillet-roasted cloves. I’ve lost track of where I got the recipe, but it was pretty straightforward. I didn’t get to try the tapenade, but it was very well-received also. With the copious leftovers, I snacked on the bean dip with carrot sticks. It and the tapenade would make lovely sandwich spreads in place of mayo. Jeremy mixed some of the tapenade into tuna salad, which gave it a pleasant tang. 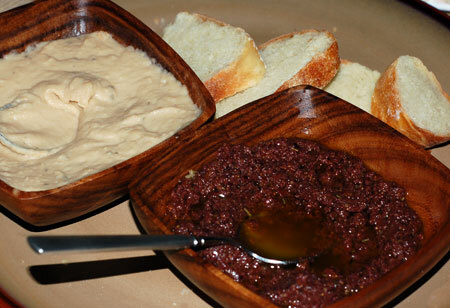 I also considered mixing some of the tapenade into bread dough for olive bread, but didn’t get around to it. 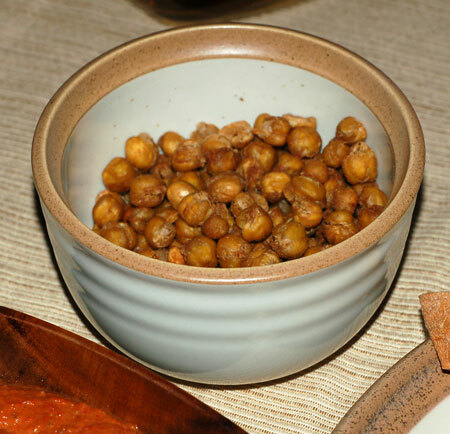 To go with the slightly Moroccan flavors of the muhammara, I decided to make roasted garbanzo beans seasoned with a Moroccan spice blend, just for snacking purposes. These were very tasty, but were largely overlooked amid the other hors d’oeuvres. These, on the other hand, were devoured entirely. I was lucky to get this photo before the last one was taken. 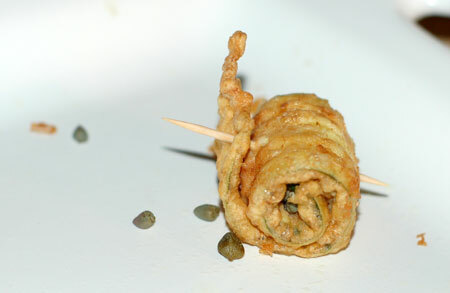 They were fried zucchini roll-ups with capers and lemon, from Lidia’s Family Table , and they were the last item I made before the party started. Like many Italian fried foods, they were intended for eating at room temperature, and made perfect little bites. I’ve done this recipe once before, but not in the roll-up version; Lidia also recommends the fried slices as a tasty sandwich filling, and I can vouch for that. Rinse and dry the zucchini and top and tail them. With a sharp knife, slice lengthwise into about 5 or 6 1/8 thick strips, flexible but not transparent. Dredge several strips at a time in the flour, shaking off any loose flour. Slide them into the eggs, and turn to coat well. Remove and allow to drain on a colander or drying rack. Meanwhile, pour canola oil into a 12″ cast iron skillet to a depth of 1/2″ and set over medium high heat. Line a large platter with paper towels and set nearby. When the oil is very hot, slip several battered strips into it; they should sizzle actively. Don’t crowd them; cook for about 90 seconds per side, so that they are nicely colored, then remove to the paper towels to drain. Sprinkle with salt while they are still hot. Once all the strips are fried up and cooled enough to handle, roll up each strips with a few capers in the center, and secured with a toothpick. Just before serving, squeeze fresh lemon juice over the roll-ups and scatter a few more capers over them. Or just leave them as strips and pile them into sliced bread for sandwiches. Source: Lidia’s Family Table , by Lidia Matticchio Bastianich (p. 21-23). Since we don’t do alcohol, I let our friends take care of that (they brought fixings for martinis and cosmos) and provided pitchers of iced tea and sparkling watermelonade as alternatives. The watermelonade was well-liked and very easy to make. I pureed the watermelon the day before, and added the sparkling water to it just before serving. Cut watermelon flesh into 2-inch chunks and discard rind. Purée watermelon in a blender in batches, adding sugar, lemon juice, and a pinch of salt in the last batch. Strain through a fine-mesh sieve into a large bowl, discarding solids. Add more sugar or lemon to taste if desired and serve over ice. 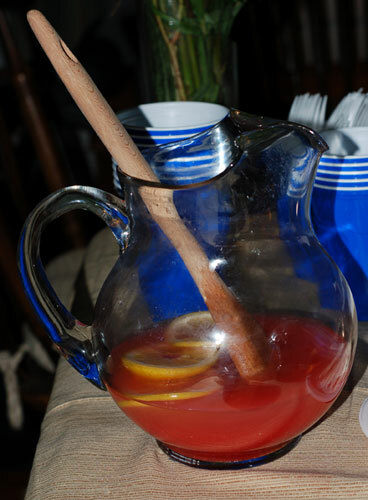 You can make this a sparkling punch by adding about 4 C mineral water, ginger ale or soda, to taste. Serve with lemon slices. Drink will separate if allowed to sit; re-stir before serving.